There are more LPs of Bernard Haitink in my collection than any other conductor. 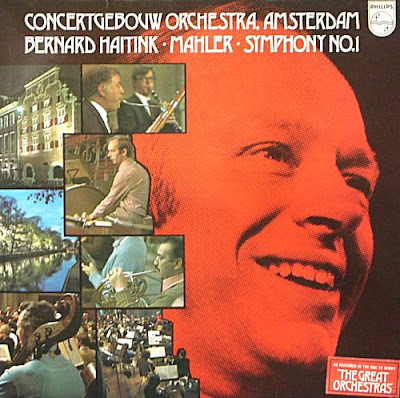 Above is the original UK sleeve for his 1972 recording of Mahler's First Symphony with the Concertgebouw Orchestra, Amsterdam. Haitink's 1970s Mahler cycle with the Concertgebouw opened my ears to Mahler, and his Bruckner was another part of my musical education. One of my great memories of live music-making was hearing Haitink conduct his Dutch orchestra in Bruckner's Ninth Symphony in 1974 in the ravishing acoustics of the Concertgebouw Hall. What a contrast to the previous evening, when I had heard Zubin Mehta conduct the Los Angeles Philharmonic in Bruckner's Eighth at a Prom in the Royal Albert Hall in London. The Amsterdam concert followed the now unfashionable practice of playing Bruckner's Te Deum after the unfinished Ninth Symphony. I heard maestro Haintink conduct many times in the 1970s when he was a central figure in European music with appointments in London (the LPO) and Amsterdam (Concertgebouw), and later at the Royal Opera House and Glyndebourne. He started to record for EMI during my time with the company, and went on to make a first-rate cycle of the Vaughan Williams symphonies for them. Haitink is best known for his mastery of the late-Romantic repertoire. 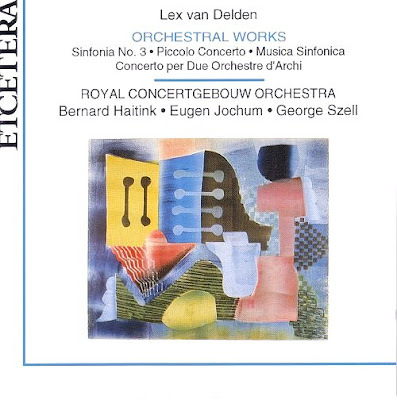 But let us not forget his work with contemporary music, including pioneering recordings of works by his compatriots Lex van Delden (see CD below), Robert Heppener, Hendrik Andriessen, and Tristan Keuris. Always disarmingly modest, Bernard Haitink is the ultimate musician's musician. It is interesting to compare the number of times that Haitink's photo appeared on an LP cover, compared with, for instance, Karajan. As I wrote back in 2005 - 'Haitink resoundingly disproves the rule that you need an odious personality to be a great conductor'. He heartily disapproves of audience participation and is one of the few truly great conductors who still see themselves as servants of the music, rather than vice versa. Bernard Haitink is 80 today. Happy birthday maestro. Thanks for those kind words pathogan. I wonder what Bernard Haitink made of BBC Radio 3's birthday tribute to him this morning? Duty classical-jock Rob Cowan played Haitink's recording of the Scherzo from Mahler's Seventh Symphony shorn of its surrounding movements. It made as much sense as fish without chips. This post thoroughly delighted me -- in its hugely deserved tribute of Haitink, then the link to Barenboim, of whom I have had more than enough, and so to Colin Davis, of whom enough there cannot be. The mention of Rob Cowan deflated things a touch, his contributions to Gramophone being a notably low point in the decline of a journal I took so much pleasure in for so many years. But overall a lovely post. Thanks for this. March 9th the first download is unlocked. And how is the CBC celebrating Hatink's 80th?Well, their new, don't-ruffle-any-feathers-with-anything-challenging-than-melody, programming philosphy, the worst kind of yuppy selling-out to being mainstream, their show Tempo advertises the following: Celebrate Bernard Haitink's 80th birthday with his timeless recording of Bizet's Symphony in C. Egads! There was a time when the CBC would have marked this conductor's milestones by programming him conducting Mahler, Bruckner, or modern Dutch composers. Not anymore.